Faster than meatloaf, meatballs are a fantastic make ahead meal option. Loading them with garlic and onion before baking gives results comparable to frying them on the stove top. Baked meatballs are much easier and less crumbly than meatballs cooked and turned over and over in the pan. I like to bake double or even triple batches and freeze the cooked meatballs. Then I have another very quick and easy meal to reheat on our busiest days. With school and extracurricular activities now in full swing, I have no qualms about speeding things along with a jar of my favorite marinara sauce to go with the meatballs. If you prefer a homemade sauce, try the quirky red sauce recipe at the end of this post. 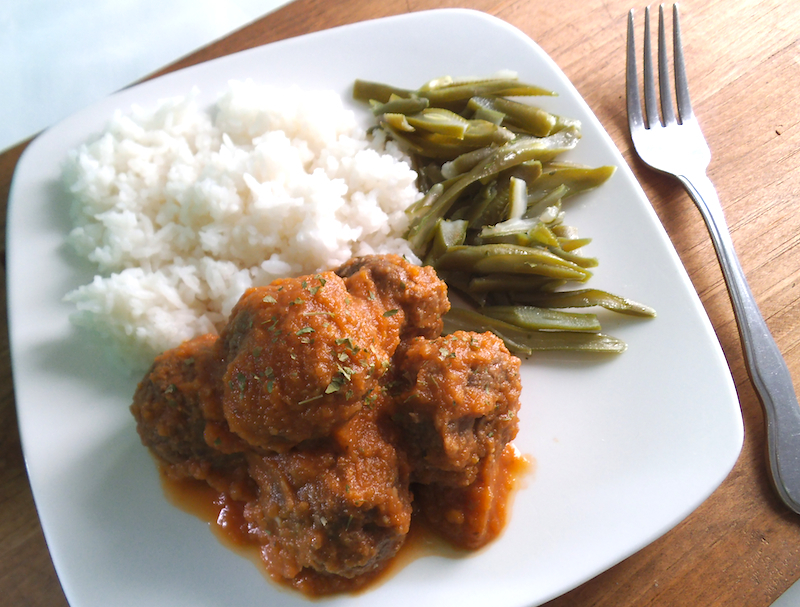 Serve the warm meatballs with rice or cauliflower rice to keep your meal gluten free. Or go for the classic combo and opt for hearty servings of steaming hot pasta to fill each plate. Preheat oven to 350 degrees F (180 C). Combine all ingredients in a large bowl and mix thoroughly by hand or with a potato masher. Form into meatballs and place in a large baking dish. Bake meatballs for 20 to 30 minutes, depending on the size of meatballs, until meat is cooked through but still tender inside. Cover and keep warm until ready to serve. This makes a large batch, so you may opt to let half of the meatballs cool and then freeze them in a sealed freezer bag or container. Serve with marinara or roasted pepper sauce (recipe below). Preheat oven to 425 degrees F (210 C). Grease two large baking dishes with olive oil. Cut peppers and eggplant in half and place skin-side up into one baking dish. Into the other baking dish, place drained tomatoes, reserving liquid in a separate container. Intersperse tomatoes with garlic cloves and rosemary. Roast the peppers, eggplant, tomatoes, and garlic until fragrant and tender, for about 25 minutes. Remove roasted vegetables and tomatoes from oven and let cool until slightly warm and safe to handle. Discard roasted rosemary sprigs (some rosemary bits may remain). Meanwhile, saute the onion in olive oil over medium-low heat until tender and golden, stirring frequently. Remove from heat. After the roasted peppers and eggplant are cool enough to handle, remove the skin from each half and discard the skin. Add the cooked onion, peeled peppers and eggplant to a blender container or food processor. Process until chunky. Add roasted tomatoes and garlic and process until smoother. Transfer pureed vegetables to a large sauce pan, add reserved tomato juice and bring to a simmer over medium heat. Stir in balsamic vinegar and 1 to 2 cups vegetable or chicken broth until desired consistency is reached. Season with salt to taste and simmer for several minutes more. Turn off heat and keep sauce warm until ready to serve. Or add meatballs and warm in sauce over low heat until serving time. 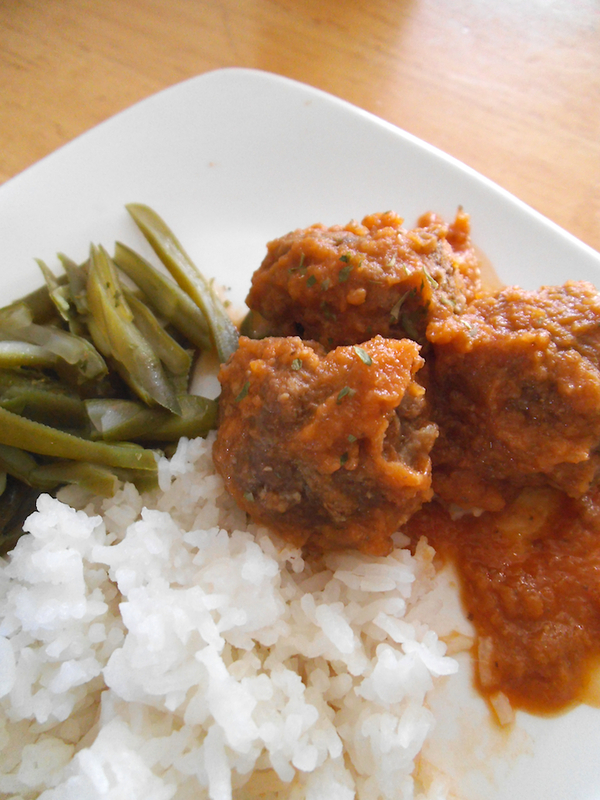 Perfect a quick and easy meat ball recipe thanks for sharing. just the sauce alone looks amazing! What a great recipe. Thanks! I think meatballs are so versatile and can be paired with many sauces.